Package dyeing is costly when compared with other forms of dyeing and much of this extra cost must be associated with transferring yarn from one form to another which adds no intrinsic value to the end product. A study on acrylic yarn showed that continuous tow dyeing is approximately 50% cheaper than yarn dyeing. Efforts have been made to minimize package dyeing costs by maximizing dye-lot size and pressure packing techniques. 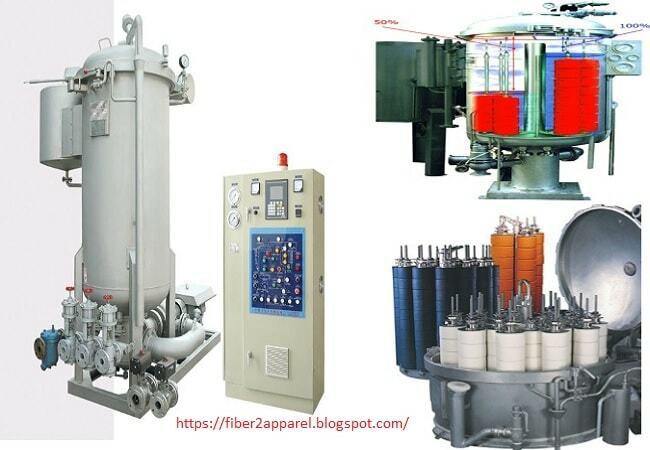 The main advantages of all packages used for textured yarn is that they are prepared on the texturing machine and, therefore, eliminate one winding process for the dryer. Spun yarns have conventionally been delivered to the package dryer on perforated cones ready for dyeing or on paper cones or tubes, which should be rewound to give the correct packages for dyeing. The former method is economical, but the dryers have little control on the package densities produced. Moreover, cone form requires expensive spacing devices and even with these, cones can slip on dyeing machine spindles giving rise to channeling of liquor and uneven dyeing. The machine load is less and flow properties are poor in cone form as compared to parallel-sided packages. The principle advantage claimed for cone-dyeing methods is that the dyeing package is prepared by the spinner and this constitutes the delivery package to the fabric producer, thereby eliminating two winding operations by using dyeing machine. I have fully discussed about textile dyeing machine, hank dyeing machine, package dyeing machine, jet dyeing machine, textile dyeing machine manufacturer list in other articles related with dyeing machine. In this article I have presented a list of textile dyeing machineries which are vastly used in textile wet processing technology. What Types of Dyeing Machines Used in Textile? Clauder Weldon hand dyeing m/c. Long close cop dyeing m/c.